The Catherine Booth House provides a long term accommodation from 10 to 12 month period and rehabilitation services for women who are afflicted by alcohol and drug addiction. The program involved in the centre is based on the Salvation Army Bridge program which is about developing social relationships with other residents and living together in a community. The aim of the brief is to provide and embrace a joyful bridging experience between drug dependency and drug free lifestyle. Any architecture should be meaningful, it should be more than an object on which people just live in and move in and out of. The centre is designed to communicate its meanings and to embrace the whole human conditions by interacting with users on a mental and spiritual level as well as the physical. A journey of 12 month experience in the centre is achieved by creating rhythm of space. The idea of merging opposites: from private to public, light and dark, void and solid, up and down… is explored to create the rhythm and thus enhancing the journey. 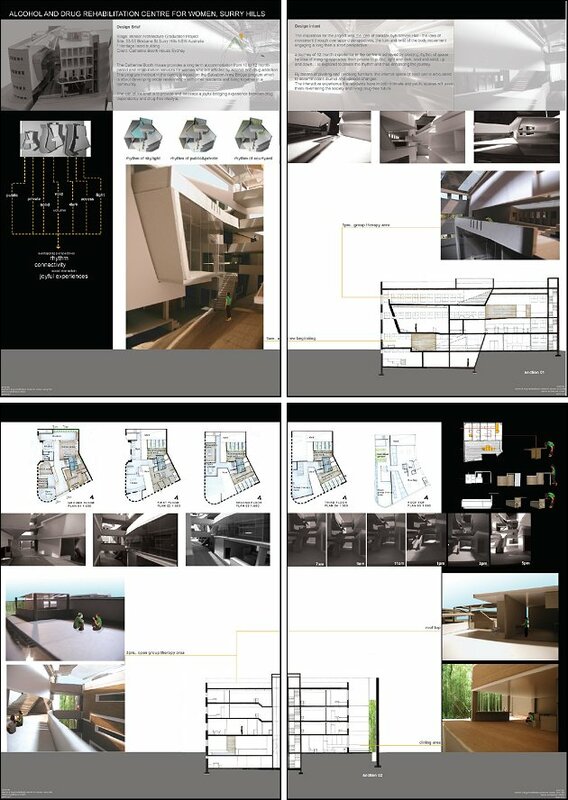 The concept is expressed thorough a sequence of different spaces. Each one tells it’s own story as you pass through it. Point of entry: acts as a ‘threshold’ to a new drug-free lifestyle. It enables visitors view the interior of the entire building with an outdoor courtyard under skylight. The enclosed chapel, footbridges that link the two most important spaces, public and accommodation spaces are seen as a short perspective. Waiting area: is located in such a way that it gives the overall atmosphere of the centre, as the first impression of the centre affect the visitor’s motivation and rehabilitation process. Child care: for children who visit their mothers at the centre. It is to give the mothers an opportunity of being a mother for one. Public areas + foot bridges: allow the residents to have a journey from instant social interaction with few people to participation in large and public community. Indoor/Outdoor courtyards: connect the residents to nature by views and access to the outdoors and interior gardens. Private rooftop gardens give individuals their own gardening space. Private areas (accommodation areas): There are 5 private rooms in each unit. Revolving multi-functional furniture is designed for an opportunity of creating own space. The internal space of each unit is articulated to accommodate daily episode changes. The interactive experiences the residents have in both intimate and public spaces will assist them re-entering the society and living drug-free future.